In today’s world, advanced vision technologies is shaping the next era of Internet of Things. However, gathering streaming video data is insufficient. It needs to be timely and accessible in near-real time, analyzed, indexed, classified and searchable to inform strategy—while remaining cost-effective. Smart cities and manufacturing are prime examples where complexities and opportunities have been enabled by vision, IoT and AI solutions through automatic meter reading (AMR), image classification and segmentation, automated optical inspection (AOI), defect classification, traffic management solution—just to name a few. 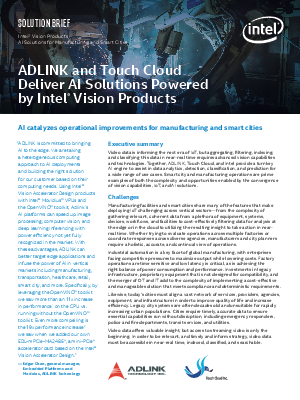 Together, ADLINK, Touch Cloud, and Intel provide a turnkey AI engine to assist in data analytics, detection, classification, and prediction for a wide range of use cases across a broad spectrum of sectors. Learn more about how the Touch Cloud AI brings cost savings, operational efficiency and a more reliable, actionable intelligence at the edge with transformative insight.